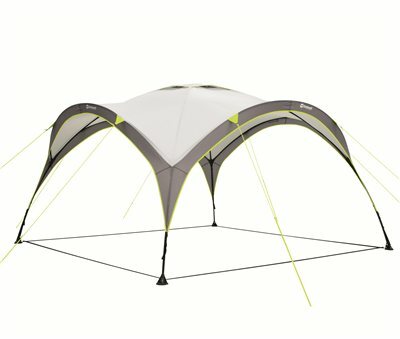 Bought the L - I pegged out the dimensions in the garden before deciding on the size, however the XL seemed a little excessive along with our large tent. Its quick and easy to put up, the colour coded dots on each pole make it really easy. I assembled the roof part on the ground before attaching the legs, seemed much easier and could potentially be done by one person. I think it took around 5 minutes on the second go. I took it to a recent birthday picnic and had lots of comments about how easy it looked to put up and sturdy it was. The packed size is smaller and lighter than our old 3x3 pop-up gazebo, and it’s a LOT sturdier. It fits a couple of families of four easily underneath with chairs and rugs. We’ve not used it yet for camping (trip with three families of four coming up), but can see it being a great shelter/kitchen area. I looked at the Coleman equivalent, but this seemed much better quality, and by the time price match and loyalty discounts had been applied, it wasn’t too much more expensive. This is a lot better than the Coleman it replaces. Poles are a lot stronger and it doesn't mind a big of wind. Easy to put up with the instructions included on the bag well worth it's price.